Embrace the best idea since the open bar: a street food wedding! Whether its the evening food or the wedding breakfast, we can toast you something special. Best parked outside your venue just as the sun starts to set. When folks feel peckish, we serve gourmet toastie goodness that appeals to all ages and even the biggest appetite. Forget the boring buffet: this is amazing hot food, cooked right there in front of your guests and designed to be eaten one-handed. The van is totally self-contained, so we don’t need to mess up a kitchen, nor do we cause washing up. In fact, you really just need to point us at a parking space and pick your menu. We’ll do the rest. For that all-important menu we can make sure everyone is catered for. Veggie options come as standard, so do gluten free toasties. In fact we can cater for any dietary requirement as long as we know what’s required. With our 75+ tried-and-tested toasties there is something for everyone, no matter what your tastes, and with our years of wedding experience we are happy to advise on numbers, choices and the importance of ham and cheese toasties. Get a quote! It costs nothing to ask, so let us know your date, guests and location, we’ll do the rest! Or just because you love street food! Looking for food for the whole day? Why not say it with street food? 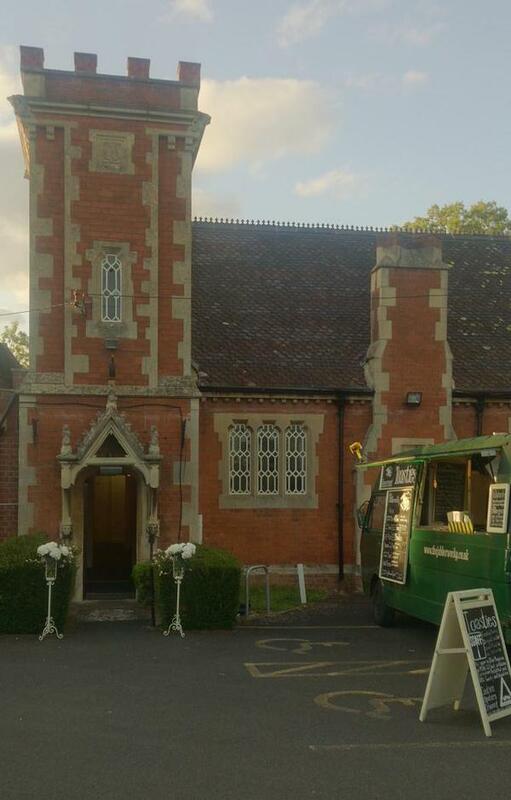 Our sister-company, Yümlaut, can provide sit-down wedding food and banquets; all served from a classic Bedford campervan. Book both vans for an iconic vintage theme or the ultimate street food wedding. Add some theatre to your event! A street food wedding means food cooked right outside your venue and served straight to your guests. It’s not only cheaper, faster and less hassle than a buffet – chances are it will taste better as well: melted cheese. I rest my case. Increase the capacity of your venue: you don’t need to seat guests who are eating street food, because it can be eaten standing up. Plus there is no cutlery to lose, plates to smash and no drunken, food-based collisions. We serve our toasties is a simple, biodegradable paper bag with a napkin. Easy. Glad you asked. We’re very proud of what we serve, and we take great pride in our product. We have also done enough weddings to know how important this day is to you, and we have been cooking and serving award-winning street food for long enough to be able to get it right. We never take a booking we’re not certain we can make, and we will always explain our quotes and services in plain English. Your wedding is probably the most varied crowd you will ever pull together for a party. You need to find food that works for your nan, your 2 year old nephew, your posh aunt-in-law and your best mate. Our gourmet toasties are simply the best wedding food when it comes to feeding every type of hungry guest. Toasties not your thing? Why not try our sister company, Yümlaut, for more street food variety! Areas Covered: We serve all across Warwickshire, Coventry and Birmingham. Beyond that we will still consider every booking in counties adjoining Warwickshire: Staffordshire, Leicestershire, Derbyshire, Worcestershire, Northamptonshire, Oxfordshire and Gloucestershire; depending on where you in the county. How many People can we serve? : We are seasoned event caterers: The van that rocks up at your wedding is the same one that toasts at music festivals. This means we simply don’t have a maximum limit. We can serve more than 150 toasties an hour, and can keep that pace up all day if we need to. You email us date, guest numbers and location. We send you a proposed menu and quote. You let us know your thoughts on menu and numbers. We rearrange just how you want it. Everyone agrees. We invoice you. You send us a deposit. The date is now yours. A week before the wedding we check in to confirm everything. The final payment is due. We rock up on the night, wow your guests with epic cheesy goodness and everyone leaves full and happy. It’s important to know that your chosen caterer is safe – we are always happy to provide details. 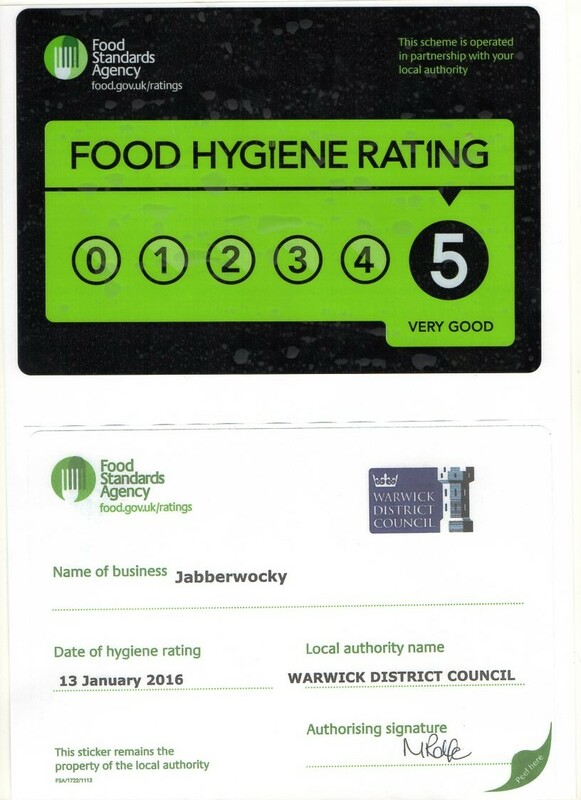 We have a 5 star rating from Warwick District Council. 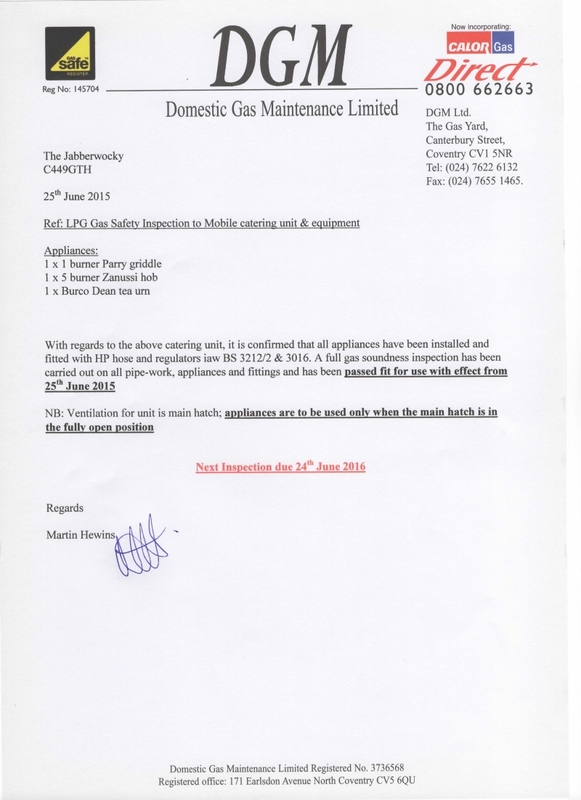 All our equipment is Gas Safety checked annually. 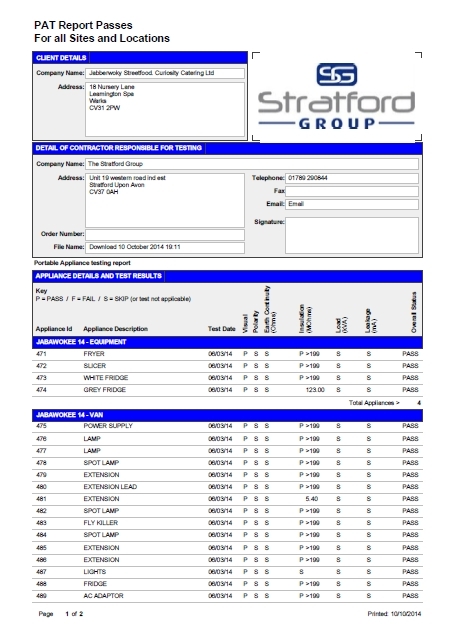 All our electrical equipment is PAT certified and safe for use. Our van needs a space 6m long and 2m wide, with safe pedestrian access to one side of the van. We need to be off the public highway for safety and legal reasons, but beyond that, the world is your cheesy, melted oyster. Do I have to pay for the food? If you want guests to pay for their own food then we can do that too! There is a call-out charge to cover the eventuality that your guests just fill up on cake, and we will worry about the money after that. We need one 13amp socket, unless we are running our deep fat fryer for sides. This is a standard indoor plug socket, to you and me. 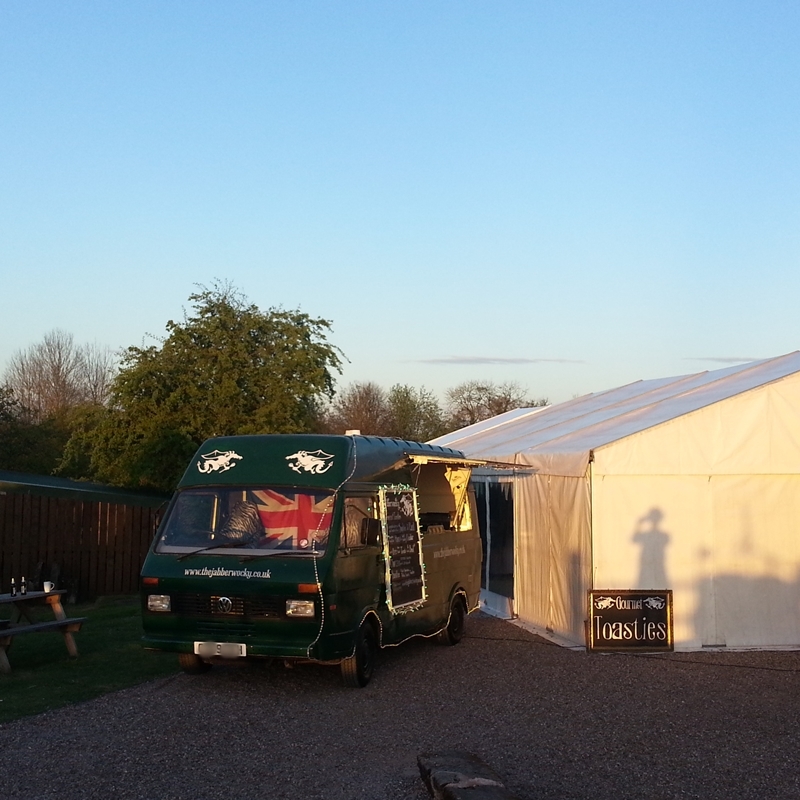 As long as that’s within 20m of the van, we will run our own extension lead and be illuminated for all eventualities. Festivities in a field? No problem. We can bring our own generator for a small surcharge. Yes. Once we have agreed all the details we will secure the date for you with a deposit. That makes it yours, 100%, no backsies. The deposit will be around 50% of your total hire charge. 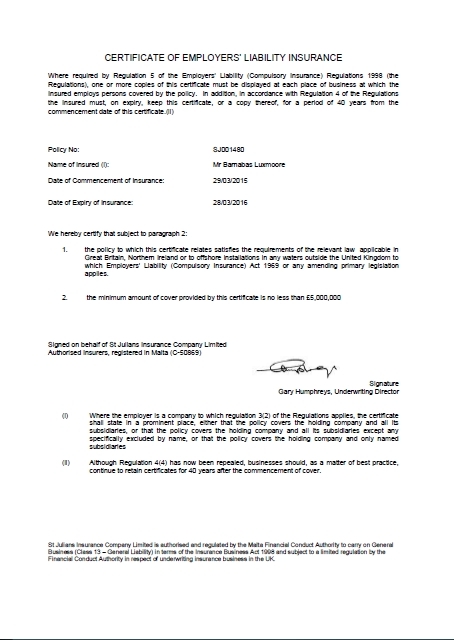 This gives you total peace of mind, because once that cash is with us, the date is blocked out. You pick your 3 hour service window, and we will be there about an hour early. This gives you peace of mind, and means that even in a crisis (argh – someone has parked in your spot and vanished) we will still be ready to serve on time. How long do you serve for? We serve for a 3 hour period of your choosing – usually between 7:30 and 10:30, to coincide with dinner time. If you would like us to carry on after that, perhaps because that best man’s speech was longer than War and Peace (with the same amount of jokes) we can easily extend for an hourly rate, payable in cash on the night. What leftovers? You don’t want to be paying for food your guests won’t eat, so we will advise on numbers for the night, we usually end with just a couple of each menu item. If we are left with heaps of food (it happens, every crowd is different) after your three hour serving window you can always extend service for longer for a small surcharge. Barney and flic did an amazing job at our wedding! The guests thought the food was amazing and totally unique. Unfortunately I didn’t get a chance to try one but will defo be hubting them down at the next street food festival. You guys rock!!! 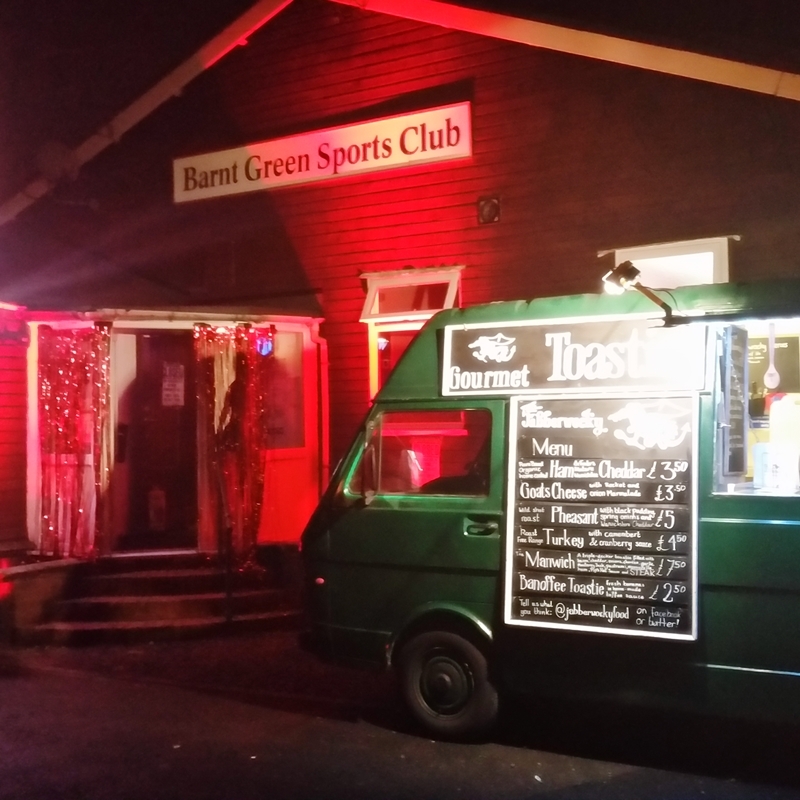 Thanks for the great toasties at our party. Everyone loved them!! Thank you so much for Sunday, the toasties were fantastic and made our day. I think #toastievan is trending amongst our friends!